This recipe comes from my sister, Jana Meyer Peters in Indiana… Such a refreshing pie to serve for spring or summer! Line two 9″ pie plates with pastry; trim and flute edges. Line unpricked pastry with foil. Bake at 450° for 8 minutes. Remove foil; bake 5-7 , minutes longer or until golden brown. Cool. In large saucepan, combine sugar, corn starch and salt. Stir in water until smooth. Cook and stir over medium-high heat until thickened and bubbly. Reduce heat; cook and stir 2 minutes longer. Remove from heat. Stir in small amount of hot filling into egg yolks; return all to the pan, stirring constantly. Bring to a gentle boil; cook and stir 2 minutes longer. Remove from heat. Gently stir in the lomon juice, butter, lemon peel, extract and food coloring if desired. Cool to room temperature without stirring. 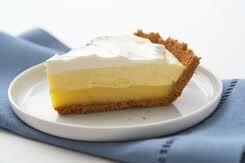 Spread lemon mixture into crusts. Refrigerate for 30 minutes or until firm. In a large bowl, beat cream cheese and powdered sugar until smooth. Gradually beat in milk. Add pudding mix, beat 2 minutes longer. Let stand for 2 minutes or until soft set. Gently spread into pies. Refrigerate for 30 minutes or until set. For topping, in a large bowl, beat cream cheese and powdered sugar until smooth. Fold in whipped topping. Spread over tops of pies. Refrigerate till set.